The fourth and final day of the Tattersalls December Mare Sale bought to a close another record year at Tattersalls with turnover topping a record 265 million guineas, the third year in a row that it has surpassed 260 millon guineas. The final session saw a total of 106 lots sell for 616,500 guineas, taking the four-day breeding stock turnover to 44,709,200 guineas, at an average of 65,652 guineas and a median of 27,000 guineas. The star attraction on the final day was ARABESCATTA, the MONSUN sister to Group 1 Irish Derby runner-up MIDAS TOUCH and to the recent Listed Zetland Stakes winner CORONET who is second favourite for next year’s Oaks. Consigned by The Castlebridge Consignment, the eight-year-old mare out of the DARSHAAN mare APPROACH was knocked down to Federico Barberini for 38,000 guineas on behalf of Kildaragh Stud’s Peter Kavanagh. "She is by Monsun with a huge page," said Barberini of the mare whose pedigree includes Classic and Group 1 winners AUSSIE RULES, ALLEGRETTO, ALBANOVA and ALBORADA. “2016 has been an historic year for Tattersalls. It is 250 years since Richard Tattersall founded the world’s first company of bloodstock auctioneers and we are proud custodians of that legacy. We are equally proud that the company has marked this special year with record annual turnover in excess of 265 million guineas and that the Tattersalls December Sale has reinforced its reputation as probably the most international bloodstock sale in the world. It has been a privilege to have welcomed buyers this week from every continent in the world and they have all contributed to a uniquely diverse sale which has brought our anniversary year to a successful conclusion. “The unprecedented annual turnover demonstrates the sustained appetite for quality European bloodstock in all sectors of the market and this has been clearly reemphasised throughout the December Sale. Record demand at the October Yearling Sale and the Autumn Horses in Training Sale has been followed by truly global participation this week. While the catalogue may not have been regarded as a vintage one, it has still inspired vibrant international competition, particularly at the top end of the market, with the outstanding mare HAZARIYA deservedly topping the sale at 2 million guineas, high class race fillies consistently commanding premium prices, and the annual major consignments from both Godolphin and Juddmonte Farms proving as ever to be hugely popular. “Eight of the top ten highest priced foals in Britain and Ireland, 76 foals selling for 100,000 guineas or more and a further 110 breaking the six figure mark this week, are all clear indicators of a market in which quality has been well rewarded. The ten highest priced mares and fillies this week were sold to buyers from Britain, France, Ireland, Japan, South Africa and the USA, while buyers from Australia, China, and the Gulf region also made significant contributions at every level of the market. As ever, we must thank our vendors, British, Irish and from further afield, who make the Tattersalls December Sale the premier sale of its type in Europe. Every year we visit as many overseas markets as possible, but the consistent support from our vendors is equally crucial in annually attracting the major global players to the December Sale. “Although we can reflect on a successful and historic year, we are also mindful that there are sectors of the market which are facing major challenges. This time last year we reflected on the significant rise in the number of horses catalogued and offered at Tattersalls and the inevitable impact at the lower end of the market. This year we have endeavoured to manage the numbers in both the October Yearling Sale and the December Foal Sale more carefully, and clearance rates held up remarkably well, but this only masks the reality that demand in the lower tiers of the market is well below the level of supply. This is an issue we must all face together, but in the meantime we would like to extend our sincere gratitude to each and every purchaser and vendor, all of whom have played a part in a memorable 250th year of selling thoroughbreds at Tattersalls." 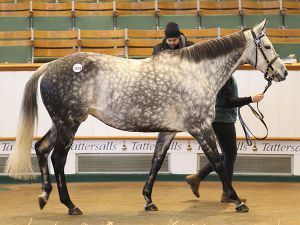 The next sale at Tattersalls is the February Sale which takes place from February 2 – 3. Entries are now being taken.